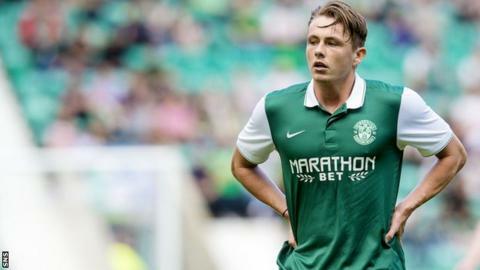 Manager Alan Stubbs insists Hibernian's stance on Scott Allan will not change amid interest from Rangers. The Ibrox club have had two bids for the midfielder, 23, rejected. "They can try all they like," Stubbs told BBC Scotland after Rangers' 6-2 Challenge Cup defeat of Hibs. "It's not going to happen. "We've got some good players and we're going to add to the good players, not lose good players." Stubbs indicated it was "hard to say" whether the speculation surrounding Allan had affected his players but added: "It's obviously unwelcome." Supporters of both sides applauded the player when he came on as a substitute in Saturday's match. "Fans from both sides obviously know how much of a good player he is," Stubbs said. Of the game, the Hibs boss rued defensive lapses at Easter Road. "I think we contributed greatly to the goals that we conceded today," he explained. "We gave some poor goals away. I didn't think there was a lot in the game, especially in the first half. "Suddenly you come in at half-time and you're 2-1 down. We gave away a needless free-kick on the edge of the box. "To be honest, I'm glad it's happened today and not in two weeks' time [when Hibs start their league campaign]. "We could've easily scored four or five goals ourselves. I think the score-line's a false reflection on the game. It wasn't a 6-2 game. "But you've got to give credit to Rangers, they took their chances well. I think we caused them problems. I thought it was two teams trying to play football. "We've still got five, six players injured who are going to come into the team. It's not demoralising. Where is this in terms of our priorities? At the bottom of them." And Stubbs hopes his players will respond in the right manner with Hibs hosting Montrose in the League Cup next week before visiting Dumbarton on the opening weekend of the Championship season. "Sometimes in football you just need a little bit of a kick up the backside just to make you focus again," he said. "Today I think that was the kick up the backside. "We knew Rangers have got some decent players and today for part of the game, we more than matched them. Goals change games and Rangers scored at important times today. "That wasn't the team, potentially, that's going to start the season. I think everybody knows it'll get better."